SEOUL, South Korea — President Donald Trump on Wednesday warned North Korea not to underestimate the United States, vowing to defend against intimidation by Kim Jong Un's regime while issuing an urgent call for the global community to neutralize the nuclear threat posed by the country. "The regime has interpreted America's past restraint as weakness," Trump said in a speech to South Korea's National Assembly. "This would be a fatal miscalculation. This is a very different administration than the United States has had in the past. "I say to the North: Do not underestimate us, and do not try us," he warned Kim, as he has previously in interviews and on Twitter, but this time 35 miles from the North Korean border. 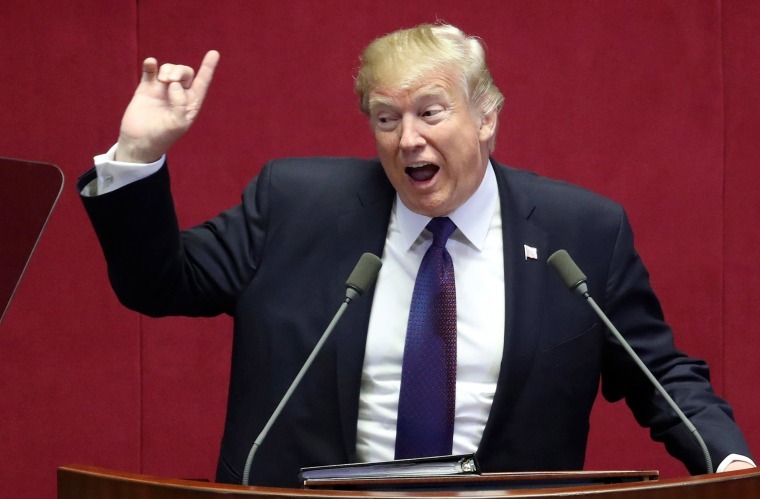 In the lengthy speech to South Korea's legislative body, Trump also urged quick action from fellow world powers to stop supporting the North through trade, calling out rivals China and Russia by name. "The longer we wait, the greater the danger grows and the fewer the options become," he said. Trump also addressed Kim Jong Un directly, appealing to him to abandon his regime's weapons program and accept the United States' offer of "a path to a better future." "It begins with an end to the aggression of your regime, a stop to the development of ballistic missiles, and a complete, verifiable, and total denuclearization," the president said to applause from the parliamentary body. Similar overtures have been rebuked in the past, and Trump even made note of all the times North Korea responded to diplomatic overtures with aggressive actions. "I say to the North: Do not underestimate us, and do not try us." "The world cannot tolerate the menace of a rogue regime that threatens it with nuclear devastation," Trump said. Trump used much of the speech to paint a vivid portrait of two paths taken by the South and the North since the 1953 armistice in the Korean War. He hailed South Korea's political and economic transformations from "devastation to one of the wealthiest nations in the world." He described North Korea as a slave state run by a "twisted regime" and described at length the "horror" of life under Kim Jong Un’s rule. The president listed the military assets already stationed "appropriately" in the region as part of his demand for "peace through strength" — an approach he campaigned on and has repeatedly espoused in office. Trump arrived to the speech hours after a failed attempt to visit the demilitarized zone due to bad weather and fog. The president also noted the one-year anniversary of his 2016 electoral victory. "I celebrate with you," he told the assembled members before delivering a succinct and positive assessment of his administration so far. The U.S., Trump said, "is going through something of a miracle itself" with all-time high stock markets, low unemployment, "and on and on and on." Though the president’s remarks on North Korea were solemn and serious, he earned laughs and cheers when he mentioned the success of Korean golfers during the U.S. Women’s Open, held this year at Trump National Golf Club in Bedminster, N.J.
"Congratulations," he said to applause. "That’s something, really something." The speech was met with a standing ovation and extended applause for Trump as he exited down the center aisle of the assembly room, trailed by first lady Melania Trump.